Historical need not mean antique. Café Korb’s traditional decor is more Warhol than Wagner, giving it a special place in the pantheon of Viennese coffee houses. Like most of the traditional coffee houses, Café Korb looks back on a rich history. It opened in 1904, where the guest list included Emperor Franz Joseph. Which leads me to visions of the superbly-moustachioed monarch eating cake, and nobody willing to point out all the crumbs caught in his royal whiskers. Anyone expecting a turn-of-the century atmosphere, though, is in for a shock. The current decor is a child of the swinging sixties, when the café underwent a complete transformation and refit. Formica tabletops adjoin their more marbled cousins, and the walls burst with photos, film posters and similar, paying tribute to some of the more illustrious guests and, particularly, Café Korb’s owner: Sudanne Widl is a celebrity in her own right…actress, artist, muse and fashion icon, to name but a few of her fields of activity. That list of illustrious guests includes names famous beyond the confines of Vienna and Austria, such as Sigmund Freud, Elfriede Jelinek (winner of the 2004 Nobel Prize in Literature), Andy Warhol and Arthur Miller. 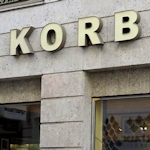 In line with the owner’s personality, consider the Korb both a coffee house and cultural rendezvous, one that pays continuing homage to the Viennese coffee house tradition, which centers around discourse and debate. Public philosopher meetings take place twice a month, and there are regular lectures, readings, concerts and similar. These “performances” take place in Café Korb’s Art Lounge in its basement. This is an authentic, no-fuss café in relatively small premises (with plenty of seating outside in warmer seasons). It bustles with regulars and local characters – the waiters seemed to know many guests -and louder than its more austere cousins. The Korb is more for excited chatter than long hours reading Proust. Given the central location close to Stephansplatz, the prices are on the imperial side of the spectrum, but our coffee was excellent and the same goes for the hefty portion of apple strudel we ordered with it. The menu includes a who’s who of traditional Viennese cooking, with its sausages, Schnitzel, Tafelspitz and other local snacks and meals, all prepared using organic ingredients. In summary, not your classical coffee house with tall ceilings and hushed corners. But one where you can experience the more artistic Viennese in their traditional element. The coffee house sits almost in the shadow of Stephansdom cathedral. Subway: Take the U3 or U1 line to Stephansplatz station. It’s a five minute walk down the scenic Graben pedestrianised street and across past the beautiful Peterskirche. Bus: Take the 1A, 2A or 3A bus to the Brandstätte stop, which is outside Café Korb. At the time of visiting (March 6th, 2019), open daily from 8 am (10 am on Sundays and holidays) to midnight.